Culms: Erect, stout, solid, round, branching toward summit, glabrous, waxy, grooved on 1 side. Blades: Flat or rolled inward or outward, 6-24 inches long, to 1/2 inch wide, usually smooth below, rough above, bluish or purplish, usually hairy near collar. Ligules: Fringed membrane, less than 1/10 inch long. Spikelets: Borne in pairs; sessile spikelets perfect; lemmas with awn up to 3/4 inch long that is bent and twisted below; stalked spikelets about same size, staminate or sterile, without awns. Habitat: Lowland prairies, plains, and open woods, in deep, fertile, dry soils. Distribution: Throughout, but rare in southwest corner. 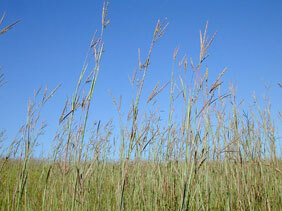 It is the most abundant grass in the tallgrass prairie region. Reproduction: Reproduces primarily via rhizomes. Forage Value: One of the highest-quality forage grasses on the prairie. Livestock relish it, usually preferring it to other grasses. Big bluestem decreases with overgrazing. Uses: Prairie chickens and songbirds consume the seeds. Comments: Sometimes called "turkey-foot" for the distinctive shape of the inflorescence. Dead stems often remain standing throughout the winter, and the leaf blades take on a reddish cast after frost.